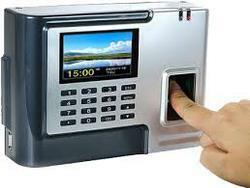 With strong intentions to enhance our standing in this competitive market, we are immersed in offering a quality assured variety of Time Attendance System. Used widely, these presented products are widely commended and treasured. As well, our ability to deal with their bulk and urgent orders and reasonable pricing structure makes these highly popular. Established in the year 2006, Red Arrow Megatron are one of the foremost firm involve in Wholesaler, trader, Service Provider and Supplier the products including CCTV Dome Camera, CCTV Bullet Camera, CCTV Camera DVR, Internet Protocol Camera, Video Door Phone, Finger Access Control System, Finger Access Control System, Fire and Intrusion Alarm System, Vehicle Camera, CCTV Camera Power Supply, Home Automation System, Audio Video Products, BMS System, Video Conferencing Solutions, Installation Services, Security Surveillance System and Time Attendance System. These are highly admitted for their conceptual design and reliability. Our products are aimed with best grade material under the way of capable authorities. These products are valued for their long lasting life, sturdiness and flawless finishing variety.